The Riigikogu holds two regular sessions every year: from January until June and from September until December. Regular sittings of the Riigikogu are held on plenary working weeks, from Monday to Thursday. Three plenary working weeks are followed by a week when there are no sittings and the members of parliament meet with constituents, go on official missions abroad and so forth. The working schedule of the Riigikogu is established by the Riigikogu Rules of Procedure and Internal Rules Act. It sets down the working hours of the committees and the plenary assembly. The schedule can be changed by voting only by the Riigikogu itself, and it is possible to change the working schedule of only one week at one voting. 15.00 – the time for unscheduled statements from members of the Riigikogu begins, to continue until no further requests for the floor are made, but no longer than until 12 a.m.
14.00 – the sitting of the Riigikogu to discuss draft legislation introduced by the Government begins and continues until all items on the agenda have been dealt with, but no longer than until the beginning of the sitting on Thursday. The Riigikogu has two regular sessions in a year. The spring session begins on the second Monday of January and ends on the third Thursday of June. The autumn session begins on the second Monday of September and ends on the third Thursday of December. During the working week of the plenary assembly of the Riigikogu, regular sittings are held from Monday to Thursday. Three working weeks of the plenary assembly are followed by a week when there are no sittings and the members of the Riigikogu fulfil other duties of MPs. They meet constituents and interest groups, attend seminars and conferences, write articles and represent the Riigikogu on official missions abroad. Did you know that after 1992, the 8th Riigikogu has held the most sittings? In addition to regular sessions, extraordinary sessions may also be convened at the proposal of the Government, the President of the Republic or at least 21 members of the Riigikogu. Besides that, additional sittings may take place during regular sessions. A regular sitting of the Riigikogu does not have quorum requirement (the minimum attendance necessary for functioning), but at least 51 members of the Riigikogu must attend an additional sitting and an extraordinary session. 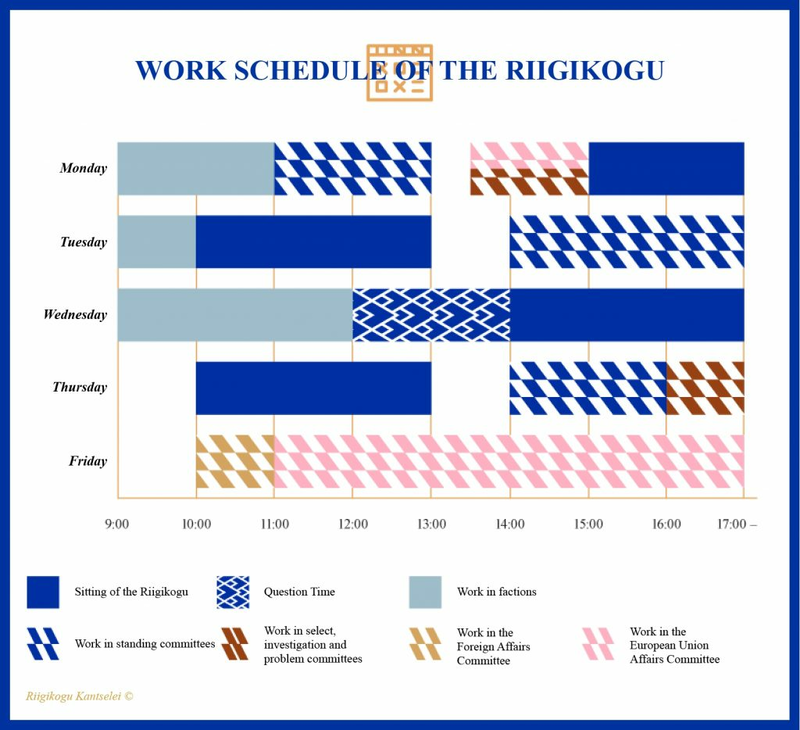 … that of all the Riigikogus elected after the regaining independence, the 9th Riigikogu worked the greatest number of hours during its sessions?